The Boys Junior Varsity Soccer team stands during the playing of the National Anthem before the start of its game against New Albany at Big Walnut High School on Aug. 18. Everyone in the bleachers, the opposing team, and on the sidelines stood, too. 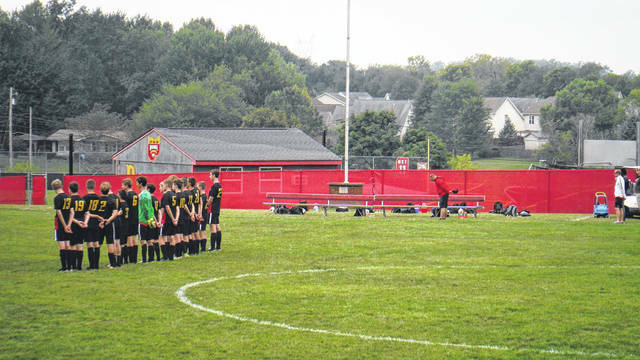 https://www.sunburynews.com/wp-content/uploads/sites/48/2018/08/web1_DSCF4133.jpgThe Boys Junior Varsity Soccer team stands during the playing of the National Anthem before the start of its game against New Albany at Big Walnut High School on Aug. 18. Everyone in the bleachers, the opposing team, and on the sidelines stood, too.